It is the key to our existence, the essence of life, the source of all power. It is the Allspark cube. Now imagine the power to bring these Transformers figures to life is in kids’ hands with Allspark Tech. Allspark Tech figures stand at a 5.5-inch-scale and feature classic Transformers conversion with a twist. Unite them with the Allspark Tech cube to bring them to life with motion-activated lights, sounds, and phrases (cube only available in starter pack). 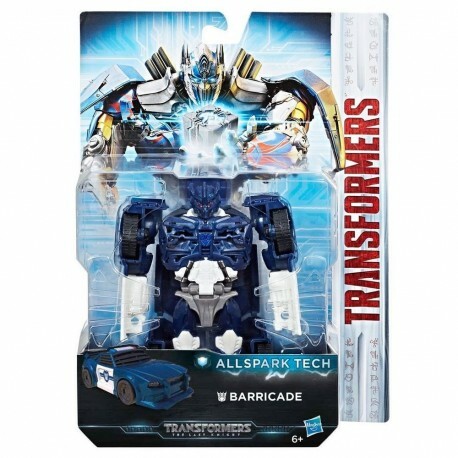 Convert this Allspark Tech Barricade figure from robot to police car mode in 5 steps. In the explosive Transformers: The Last Knight movie, a new evil rises in an epic struggle where the fate of Earth hangs in the balance. Barricade is the police officer no one wants to encounter. Disguised as a cop car, he patrols the streets to enforce the law of his commander, Megatron. 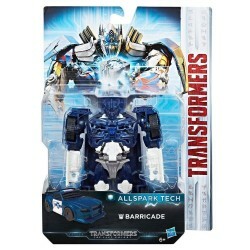 • Includes Transformers: The Last Knight Allspark Tech Barricade figure and instructions. • Figure works with cube available in the starter pack. Sold separately. Subject to availability.